What originated as diet Sprite is now called Sprite Zero -- a transparent, lemon-lime flavored soft drink that uses artificial sweeteners to produce a low-calorie, caffeine-free soda. Produced by Coca-Cola, Sprite Zero is known for a crisp, clean taste without the high sugar content found in other soft drinks. Using artificial sweeteners and a variety of ingredients, Sprite Zero has a specific list of nutrition facts. The ingredient list for Sprite Zero contains only seven ingredients. The combination of ingredients helps to form the appearance and overall flavor. Carbonated water, citric acid and natural flavors are the first three ingredients and are responsible for flavor and color. Potassium citrate and potassium benzoate preservatives that protect the taste and aspartame and acesulfame potassium are artificial sweeteners. Diet Sprite is considered a low calorie soft drink and contains 0 grams of fat, carbohydrates and protein. Without fat, carbohydrates and protein, Diet Sprite contains zero calories per serving. According to the nutrition label, Diet Sprite is not a significant source for numerous vitamins, minerals and nutrients such as fiber, vitamin A, vitamin C, vitamin B, vitamin D, calcium or iron. The most significant mineral found in Sprite Zero is sodium; but it is still considered a very low sodium soft drink. According to Coca-Cola, sodium is an important mineral for soft drinks and helps to maintain your body's water balance. One 12- ounce serving of Sprite Zero contains 35 milligrams of sodium for one percent of the daily recommended intake. Soft drinks are known for a sweet taste, but Sprite Zero delivers a sweet taste without excessive amounts of carbohydrates and sugar. 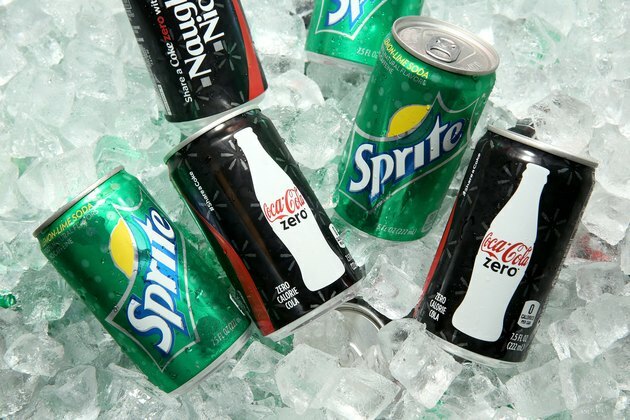 The two artificial sweeteners found in Sprite Zero are acesulfame potassium and aspartame. Acesulfame potassium and aspartame are 200 times sweeter than table sugar and don't supply any calories. If you have a condition called phenylketonuria, or PKU, it means you can not break down the amino acid phenylalanine. Part of PKU treatment is avoiding foods with phenylalanine. If you do consume products with this amino acid it may have a laxative effect on your body and cause severe intestinal distress. The aspartame in Sprite Zero contains phenylalanine, which means it is not a good drink choice for you.